Niral is the newest fragrance from Neela Vermeire Créations,1 a Paris-based niche house offering "French contemporary classic perfumes with an Eastern heritage." Each fragrance from this line tells a cross-cultural tale, and Niral is inspired by British silk expert and industrialist Sir Thomas Wardle and "his immense contribution to the promotion of Indian wild silk trade from Bengal and Kashmir to Europe," particularly his innovations in dyeing tussar silk. Niral was developed by perfumer Bertrand Duchaufour and it includes notes of iris, tea, pink pepper, rose, green wine lees,2 cabreuva, angelica seed, ambrette seed, cardamom, leather, magnolia, jasmine, sandalwood and cedar. Its name comes from a Hindu word meaning "unique, calm, serene," and it does feel serene, in a very elegant way. Years and years ago, when I first started reading conversations and posting reviews on MakeupAlley, I was intrigued by the sensory associations my fellow aromaphiles were making between various fragrances and types of music, times of day, or fabrics. Neela Vermeire's analogy of tussar silk for Niral seems apt — not only because of tussar's history, but also because Niral easily evokes rich jewel tones with a shifting metallic sheen. As an overall composition, Niral doesn't bother with light or airy top notes. Instead, it starts right off as a smooth and subtly root-y iris scent. If you're an iris-lover, you'll want to try it for this reason; but there's still more to love, like the surrounding accords that make me imagine red wine and Darjeeling tea, and a spicy, moody rose in Niral's heart. There's also an aldehydic effect that "lifts" everything a bit. Niral is so gracefully constructed that its base is hard for me to pick apart; I can't really isolate the leather or cedar, for example. What I do notice is a creamy sandalwood entwined with something resinous (elemi?) — there aren't any incense or resin notes in the "official" list, but incense is something of a Duchaufour "signature" and I'm noticing it here. It's a quietly magical base. On my skin, Niral has moderate sillage and excellent staying power, yet despite its complexity and depth it never feels heavy. I can imagine wearing it most of the year, with a break for the summer months. Niral and Mohur are now my favorites from this house; they have different moods (Mohur feels more festive, more lavish, where Niral is poised and gracious), but both are Perfumes with a capital P, and both are beautiful. Neela Vermeire Créations Niral is available as 60 ml Eau de Parfum ($250). For purchasing information, see the listing for Neela Vermeire Créations under Perfume Houses. 1. For full disclosure: Neela and I were both regulars at MakeupAlley back in the early 2000s and we finally met in person at a fragrance event when she was first launching her line. As usual, however, I wouldn't bother to review this fragrance if it didn't truly appeal to me and/or give me something to think about. 2. I don't know anything about wine, but according to Wine Spectator, "Fine lees, the dead yeast cells leftover from fermentation, can enhance an aging wine with added richness, flavor and aroma complexity." 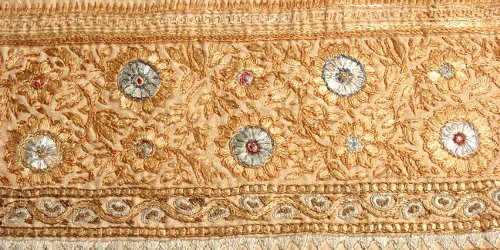 Note: top image is Edging, piece ("Edging, piece, two pieces joined, fine cream silk embroidered in silk, geometric and stylised floral border patterns in blues and tan colours, some gold thread" / "Unknown date; Victorian-Contemporary Age-European and British-art and design period; 1880s") [cropped] from Elizabeth Wardle; Thomas Wardle; The Leek Embroidery Society; Hencroft Dye Works via Wikimedia Commons. I am dying to try this one! So glad to hear you like it. My favorites of hers so far are Mohur and Bombay Bling. I never would have expected to like Bombay Bling, but it’s just fun. I agree! Mohur was my favorite of that trio, but Bombay Bling made me smile. And I was hoping that it would be a really good iris and it sounds like that is the case. It is…and I’m so glad it lasts well on my skin, too, so I can prolong the enjoyment! Ah! Someday I’ll get to one of those big events, I hope…! Have a wonderful time! Thank you for the review Jessica. It sounds gorgeous! A must try asap. You’re very welcome! I do hope you’ll have a chance to try some soon! I have only bought a handful or so of full bottles of fragrances, at full price, from top tier perfume shops, and two of them are Mohur and Pichola. Oh ya. That feels better! I am right there with you. ???????? I don’t blind buy, but I’m so tempted. Mohur is one of my all time favorites, and this one sounds so lovely. hahah! Well, now I hope it lives up to the anticipation/expectation! Neela Vermiere is one of my favorite houses. I wore Rahele today. I’m so looking forward to sampling Niral. Thanks for the review Jessica! Hooray! They really are doing strong work together, aren’t they? I hope you’ll have a chance to try Niral soon! Thanks for the review, Jessica! I like a lot of the same fragrances you do, and Mohur is way up there among my favorites. I was looking forward to sniffing Niral, and now after your review, I’m (maybe a bit overly) excited to get my hands on it. Mohur is gorgeous! Niral is a little less adventurous than some of the others in the line, but it’s beautiful in a more classical way! Sounds FABULOUS! I look forward to trying this. Mohur Extrait may get knocked off its perch as my #1. I’m going to sample the Mohur Extrait soon… really looking forward to wearing it! I just got my sample and it is really lovely, my favourite of the line so far. Very elegant and subtle. When my perfume budget recovers I would like to purchase. I agree—so elegant, yet not stuffy! I think I’d wear it more often than Mohur, which requires a little more fanfare. I enjoyed my sample too. Its very long lasting and the base really reminds me of Mohur (it has that house DNA). I’m not too sure its full bottle worthy personally. Its not unique in my opinion but its very well done. I hope she will offer this in her travel spray format (the 2 x 15 ml). I have noticed that Rahele wasn’t offered in that format though. I hope that more fragrances will become available in the 2 x 15 ml bottles, too! Maybe it’s a gradual process? In any case I have a full bottle of that so I don’t care ???? Hopefully Niral gets the Take Two treatment. I would prefer a smaller size of that one. You caught my attention when you wrote Bertrand Duchaufour. I have never tried any Neela Vermeire scents but it looks like that is about to change, thanks to your review. I have always loved the smell of raw silk, that nubby, off-white, slightly speckled fabric, like the daytime version of shantung. Takes me back to the 1970s when silk blouses did not cost a fortune. Thank you very much for the review. Reading just a bit about tussur/tussaur silk has made me want to know more about silk in general! and maybe wear it more often, if possible.